TRIZ video course is totally novel product on the market of educational materials on innovation, creativity and invention. It differs from recorded webinars and lectures. It compresses the information you get from 500-pages book into visual form. You study 2 hours 43 minutes instead of three days of full-time training. 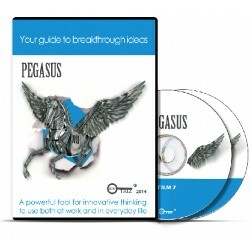 Together with the book "Inventor's Manual" PEGASUS-video gives you knowledge that you can start to apply and see the benefits. Please click here to see the content of DVDs.